Winter is finally beginning to loosen it's grip on the high country of Rocky Mountain National Park. Sprague Lake had started it's annual spring thaw before another spring storm coated the shores and trees of Sprague Lake with a coating of heavy wet snow. The edges of Sprague Lake have refrozen from the storm, but most of the lake remained clear of ice. 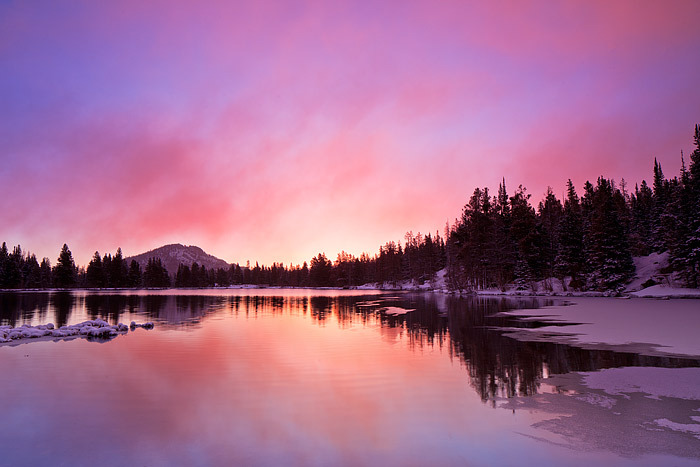 As the Sun begins to rise in the east, the clearing storms clouds relect a beautiful red, magenta and blue from the shores and waters of Sprague Lake. Photo © copyright by Thomas Mangan.